We work in strategic fire planning and we want to do something for a species potentially threatened by fire in Victoria's Central Highlands, and not a cute and cuddly one!! Voting has closed. The winning challenge is We will take new arrivals from a migrant or refugee centre out for a day in the bush - our Central Highland backyard. Peter is raising money to support the Southern Corroboree Frog. Voting is now closed. Peter's pledge is closed for voting, but you can still support Peter and the Southern Corroboree Frog by making a donation using the 'Make a Donation' button above. Peter has pledged to complete the most popular challenge — We will take new arrivals from a migrant or refugee centre out for a day in the bush - our Central Highland backyard. This pledge is part of the East Central Bushfire Risk Landscape team. Help Peter raise money for the Southern Corroboree Frog. 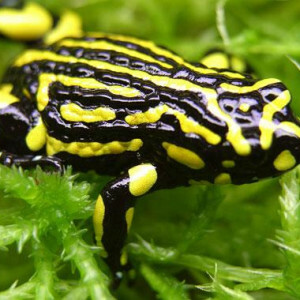 Support Peter West by donating directly to the Southern Corroboree Frog.